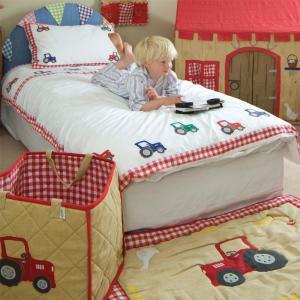 Our Barn Cushion Cover is appliqued and embroidered with a big red tractor and finished with a red gingham border. Thank you for your help and patience.I have received my Florence bookcase yesterday. My girls love it high quality and beautiful.The deliver mans was very friendly. We all love a day out on the farm! This fun and colourful playhouse is appliqued with a red tractor, cockerel, duck and ducklings, a farm cat and even..